Have you ever wondered what the first impression of your store is when a customer walks in? What is it that drives browsers into buyers, buyers to repeat-customers and these repeat-customers into loyal patrons who turn out to be influencers of your brand? All shoppers love to have a good experience every time they step into a store. Whether it’s a small store in a mall or a large outlet by itself – shoppers are only looking to be engaged and informed rather than being ‘sold-to’. While most surveys show that the traffic to brick and mortar stores have had a significant reduction ever since the inception of e-commerce, people still are drawn to retail stores to get a feel of the product they are buying and for personal experience. Hotspot or a focal point is an important aspect of a store layout. This can either be an entire display or just an item that stands out from the rest of the store. Hotspots create a positive customer experience by giving people a place to rest their eyes on. A research carried out by Russell R. Mueller shows that a well-planned hotspot can increase sales by 229%. Remember where ever the eyes go the feet will follow! The first few feet within the store is where the shoppers take time to adjust to the space before deciding which section to walk to. So more often than not, most of the products placed in this space are largely ignored. And hence, designing an effective decompression zone becomes vital. Using lighting, flooring, textures and materials that is in contrast with the outside environment is a great way to do it. Retail sector is changing faster now than ever before. With so many consumers shopping online today, retail experiences should be both memorable and impactful. Changing up the retail fixtures around a theme for holidays and special occasions like Christmas, Diwali or a discount sale grabs the attention of shoppers and can work wonders in spiking up the sales. But when you are looking to add flexibility and seasonality into your store, it’s also important to consider what elements to keep consistent to ensure branding is not affected. The path to purchase should never be neglected while designing a store layout. Once the shopper has navigated his way to the product he is interested in and has decided to buy it – the retailers need to make the path to purchase as clear and simple as possible. This ensures a pleasant shopping experience and encourages them to return time n again! Do not ignore the color. Colors can make or break the visual displays at your store. According to a study, Colors can increase brand recognition by 80 percent! So rather than simply choosing colors for the store, start with choosing a theme and then colors that represent this concept/theme. It’s also important to use colors that comfort the customers – For eg: Warm colors like oranges and browns are inviting to shoppers, while cooling colors like green and blue can have a calming effect. Creating the best possible customer experience or shopper engagement is always an ongoing process. Try gaining consumer insights by tracking how customers shop within your store and not just what they buy in your store. Take clue from these insights to know what kind of fixtures work the best for your brand. Remember your customers are the biggest ambassadors of your brand! 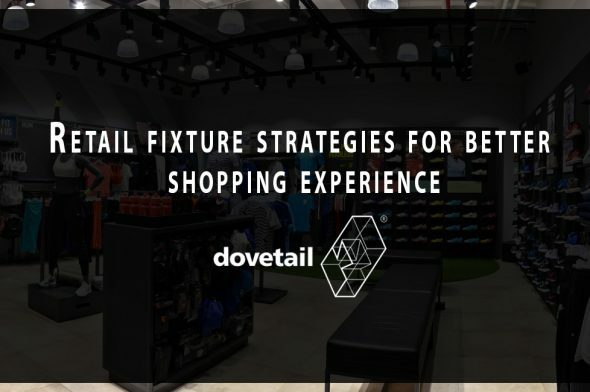 Dovetail turns ideas into reality, with its strengths in design-engineering, comprehensive manufacturing and infrastructure with an experience of over three decades in shopfitting for global and local brands. Dovetail has a team of skilled technicians and engineers ready to take on new challenges always! 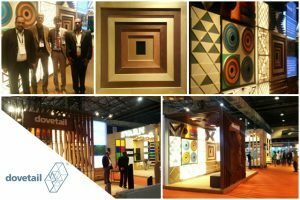 Dovetail showcased a live palette of a range of a range of materials and finishes for retail fixtures at the Instore Asia 2018 event.